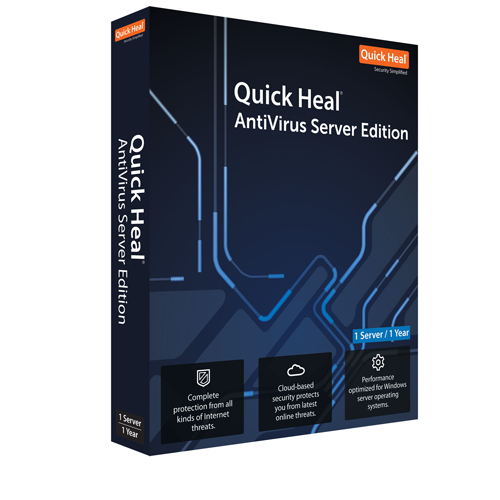 Quick Heal AntiVirus Server Edition is specially designed and optimized for providing complete protection to Microsoft Windows Server Operating Systems. It offers complete protection to Windows Servers from all kinds of malicious threats without compromising the Server performance. Its optimized scanning technology provides high performance by utilizing minimum server resource making it ideal for large corporate servers that experience heavy loads, and system administrators who expect an intuitive and a power packed performer for the servers they maintain. Detects viruses before the system is infected. It is light on server resources resulting in faster server performance. Prevents virus attacks on your server by continuously monitoring and blocking virus infection. Data on server is valuable and often vulnerable to theft. This feature blocks access to removable drives (USB drives, Pen Drives, Memory cards, etc.) thereby blocking to-and-fro transfer of data from the server to these drives. The powerful filtering engine identifies and filters junk and unwanted emails as Spam. Since email is most widely used for communication, newer virus use email as a medium to spread. The Mail Protection feature has been redesigned to provide an effective counter measure against threats to servers. This new feature from Quick Heal enables you to monitor and filter all HTTP traffic coming from Web sites on the Internet. It is browser independent and has little/no impact on browsing speed. The autorun feature of removable devices is one of the ways through which malware is spread. This feature secures removable devices (Pen Drives, Memory cards, etc.) and prevents spread of infection through autorun malware. This feature works silently in the background and monitors network activity for malicious behavior to ensure the elimination of malware before they can reach the system. Blocks Autorun malwares from entering the server by disabling the Autorun feature of the server. Comprehensive protection against spyware, malwares and rootkits.